Born in Helsinki in 1967, Olli Mustonen took his first harpsichord lessons at the age of five and was taught to play the piano by Ralf Gothóni at the age of seven. A year later he made his first composition attempts, and from 1975 he studied composition with Einoiuhani Rautavaara. Soon, Mustonen was much sought after, both as a conductor and as a concert pianist (studies with Eero Heinonen). Since 1989, Mustonen has been playing an active role in the musical scene of his home country; first, he became Artistic Director of the Korsholm Music Festival and from 1990-1992 of the Turku Music Festival, as well. He is co-founder and Artistic Director of the Helsinki Festival Orchestra, and since 2003 Artist in Residence at the chamber orchestra Tapiola Sinfonietta. 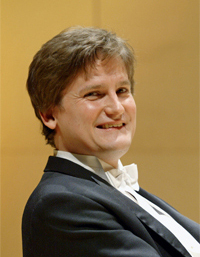 As a pianist, Mustonen has given concerts with numerous major international orchestras such as the London Symphony Orchestra, the Royal Concertgebouw Orkest, the Chicago Symphony Orchestra, the Berlin Philharmonics, and others. In addition, he maintains close working relations with renowned conductors such as Daniel Barenboim, Pierre Boulez and Christoph Eschenbach. In 1999, he performed the world première of Rodion Shchedrin's Piano Concerto No. 5, which is dedicated to him, with Esa-Pekka Salonen and the Los Angeles Philharmonic Orchestra. For his recording of Preludes and Fugues by Dmitri Shostakovich and Preludes by Charles-Valentin Alkan, Mustonen received both the Edison Award and the Gramophone Award in 1992. Mustonen's predilection for contrapuntally interwoven compositions and works of the 20th century which take up ideas from the 17th and 18th centuries (e.g. the Bach arrangements by Ferruccio Busoni and the cycles of preludes and fugues by Paul Hindemith or Shostakovich), is reflected in his own works, as well. The concentration on instrumentation and rhythm as well as the use of genre names such as Gavotte, Toccata or Petite Suite are points in favour of this affinity. Mustonen's works attain their individuality through their fresh tonal language rooted in the sonority of the music of his come country. While it is the pianist who is to the fore in the concert halls throughout the world, it is the conducting and composing activities of Mustonen from Hausjärvi (Finland) which are becoming of growing interest to the public.